An item we've all used at some point, our 3m/10ft Measure Tape in ABS Case is both practical and hardwearing. It has been designed to suit both commercial and domestic needs. Whether you're teaching construction skills to pupils or taking measurements to renovate your home, this is the tool for you. We ensure that, along with the other lines in our range, our measuring tape is hardwearing, lightweight and long-lasting. 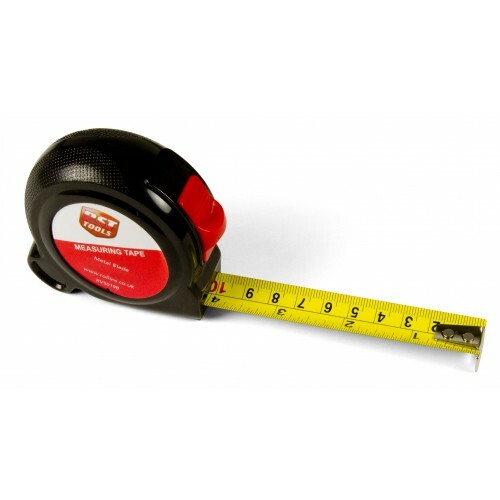 The durable ABS casing offers suitable protection to the tape measure which rolls up compactly inside. Included in the design is a large red button, suitable for locking the tape measure at a certain length. Once you've finished measuring, the button also releases the measure and allows it to spring back into its case. The tape measure housed inside has a bright yellow colour with black and red numbers and line markers. Using the traditional measuring skill, you can take accurate recordings of distance between two points. The main benefit with this specific tool is the compact design which fits comfortably into tool boxes and pockets alike. Here at The Ruler Company, we design and manufacture a wide range of measuring tools to suit every need. No matter your business or the project you're working in, we have something here for you. This 3m/10ft measuring tape is one such example, providing you with the right tool to take accurate measurements in any environment. If you have any questions about our tapes or other lines available here, contact us today.